Although still in his 20’s, PJ Rasmussen (@PJRasmussenJazz) has headlined two national TV specials, been featured on the cover of Hot House Jazz magazine, headlined at the Four Seasons restaurant in New York, and landed two albums on the jazz charts. Bucky Pizzarelli calls him “a damn good guitarist.” He believes jazz is music that should make the heart race, the blood pump, and the feet move. Towards that end, Rasmussen founded the Boardwalk Jazz Band, New York’s only 21 piece band to feature four different vocalists and almost entirely original music. Born in 1990, Rasmussen entered a world where jazz seemed reserved more for intellectuals than real people. Picking up the guitar at age 10, he spent more time learning Stevie Ray Vaughan and Eric Clapton than working his way through the Real Book. While his passion for rock and blues never waned, his eclectic taste and exploratory spirit never stopped looking for new music to learn; soon enough he was practicing Joe Pass and Yardbird alongside Slowhand under the watchful eye of Andrew Light. 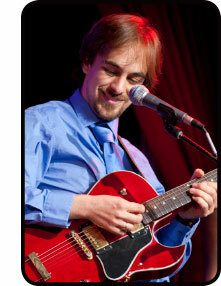 A great guitarist in his own right, Andrew introduced PJ to the wide world of jazz. He has never looked back, studying Jazz Performance at William Patterson University and leading groups that have included Scott Robinson, Rich Perry, Jim Ridl, Steve Davis, and a host of others. “An American Christmas” was the Boardwalk Jazz Band’s first national television broadcast. Filmed at the City Winery in NYC, the special was available in over 90% of homes across the country, anchored by WCBS ch. 2 and airing Christmas day. The show, which also featured special guest Bucky Pizzarelli, was immediately renewed and and a 2017 broadcast will air this holiday season. The success of “An American Christmas” also led to “Sounds of Summer,” which aired locally on WABC ch. 7 as well as about 100 other stations across the country. The show was also quickly renewed for next summer. For more information on “An American Christmas,” click here.